Its 4am and the alarm clock on my phone starts to buzz. I purposely put my phone on a table away from my bed so that I actually have to stand up and walk to switch it off. On a normal day, in my usual zombie state in the morning, even this sneaky game I play on myself doesn't actually work. Over the years I have managed to evolve to a higher level of being where I can walk to my phone still asleep and then walk back to bed without even opening my eyelids a couple of millimeters so that I don't bump into some of the usual obstacles that line my bedroom floor. However today is not a normal day as I need to get to Marlow as I am traveling to Norway with a school on a Duke of Edinburgh gold assessment. It's still dark when I leave the house, which surprises me a little and after packing my usual red North Face extra large duffel bag into my van, I’m ready to go. This bag has been with me on every adventure in the last 10 years and bears the scars and the red African dust to prove it. It seemed like a rip off at the time costing more than a hundred quid when I bought it, but I’m pretty sure I've got my money's worth now. A beautiful sunrise greets me on the way down the M6, with a wonderful array of reds and blues. What exactly are the shepherds trying to warn us about when they see one of these glorious sights at dawn? After what feels like a long drive down, helped by Radio One playing some late hours drum and bass I arrive at the school. Most of the pupils are already there, with plenty of quiet conversation going on and parents kissing foreheads and checking they have packed enough underwear. This can have a big impact on the journey, as we have tunnels and ferries booked that we need to keep good time to get to. The drivers look well traveled and I trust that they will get us there on time. There is little I can do to help, so I unpack my luxury travel pillow and try and catch up on some sleep that I missed out on from last night. We arrive at the channel tunnel terminal later than planned, but it doesn’t seem to be an issue and they book us onto the next train. The weather is unusually sunny it seems down here, a man with brown skin like me doesn't want to go underground in a train on a day like today. To be honest though, going underground is actually preferable to getting on the sea, as for someone who has spent most of his life paddling around on the river, I usually feel quite sea sick on a ferry. I awake from my slumber like a hedgehog brought out of hibernation early as we pull into a service station. I realise that this is the first journey in a very long time when I've been on a road trip like this and havent had any part to play in either the navigation or the driving. It is such a novelty and a pleasure. However, because of this I have absolutely no idea where we are and what country we are in. I found this in the service station shop. 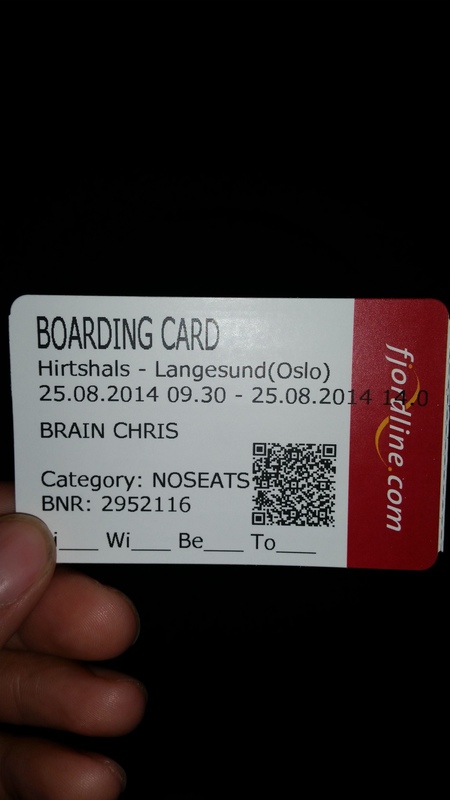 Only in Norway! All my Saturdays spent watching "murder she wrote" were not wasted when I spotted a windmill, a canal and lots of flat grassy fields and decide that we clearly are in the Netherlands. Once everyone is back on the coach, Matt our trip leader tells us we are currently well on our way traveling through the Netherlands. With a slightly smug look on my face I think, Angela Lansbury would be proud. The coach drivers are an interesting pair and have been doing their "Steptoe and Son" routine since we left the school in Marlow. As funny as they are, their comedy doesn't seem to overcome the fact that they don't seem to have enough drivers to actually get us to our next ferry on time. I offer to do a stint behind the wheel, but it seems to fall on deaf ears. The air conditioning is broken in the bus and it is blowing at sub zero temperatures constantly. I wrap myself up as best as I can in my down jacket, sleeping bag liner and stuff and extra jacket by my legs to keep warm. I slip on my oversized headphones, scan through my phone and come across the best of Nina Simone. The ten minute live version of "Sinnerman" is just what my ears need right now. I close my eyes and it's not long before I'm back in my hedgehog state. The coach is dark and we are all trying to get some well-needed rest. My sleep is only broken from the unmistakable sound of the bus wheels going over the rumble strips on the motorway occasionally. Its still ridiculously cold in the bus and I resemble a glow worm wrapped up in my sleeping bag liner and down jacket combo. I cant get comfy and every time we go round a tight corner, Im not ready for the feeling my eye socket to be pushed into the window that I'm leaning on once again. The ferry port is clean and tidy and looks really well kept and still in its new state. It doesn’t look at all like the ferry port at Dover and my mind wonders what anyone traveling to he UK must think when they arrive in that unloved, well worn ferry terminal. As we get ready to board the ferry I am met by a man, who in a previous career must have been a professional heavyweight wrestler. He is now working on the ferry security and he wants to have a look in my bag. He has an almighty looking sniffer dog in hand and much to my own surprise I have a real desire to pet and stroke it. After having a startling realisation as to the fact that is not a clever idea, I bring my hand back down and slide it into my pocket. Hulk Hogan, aka the ferry security man is happy and I am on my way. After an incredibly engaging conversation with Jeremy, one of the other expedition leaders on the trip about how to collaboratively work on a project I am putting together, we once again board the coach and "Ted and Dougal" continue to drive us on our epic adventure. As we are now operating with one less driver, the journey will inevitably take much longer as the driver needs to have bigger breaks. Matt announces this to the team and I really feel for him, Ive been that person giving this kind of news to a group and it isn't a nice thing. The group seem to take it well and there isn't much groaning, to be honest I'm not sure what other options they have. I offer to drive once again, even if only to have some humorous interaction with our vehicle's captain. He knows that I genuinely can't get in the drivers seat, but he still says yes all the same. As the sun sets and I start to wrap myself up once again in my sleeping bag chrysalis, I have a moment to think to myself how lucky I am. Im pleased with this lifestyle I've crafted for myself, even if it means that I spend a couple of days in an uncomfortable chair on a coach every now and then. A moment passes where I wonder what I would be doing if I wasn't doing this, if I wasn't into the outdoors. I don't care much for that alternate universe, it doesn't sound particularly exciting. I slip on my massive headphones once more and search through my phone for some music. In honour of our driver that had to go home, I put on PJ and Duncan’s "Lets Get Ready to Rumble". It's 00:15 and my spider sense is tingling. I can hear the faint sounds of giggling and Im pretty sure they are giggling at me. As I stir slightly, I feel a small pile of objects shift around my body. I open my eyes and find random objects placed on top of me including a can of de-icer, a first aid kit, a woman's magazine and some plastic bottles. It sounds like I've been playing a strange version of the last round on the generation game, but I haven't, Ive unknowingly taken part in human buckaroo and I’m the mule. I take this in really good humor and to be honest find it hugely funny. I really believe that with practical jokes, what goes around comes around and it was certainly my time for it to come around. It was also nice because I got a sense that I was being welcomed onto the team. We arrived at the campsite not long after and it wasn't long before I had my tent up and was starting to wind down to go to sleep. I asked Jerry, one of the other expedition staff when everyone was getting their food for the trip and he smirked a little and informed me that everyone had already got sorted before they left the UK. As seems typical of my life, I think I missed the memo on that one. To be honest what is more typical of me is that I saw the memo, thought about reading the memo but didn't and then forgot a while later that the memo even existed. Jerry is incredibly kind and does a great impression of the first celebrity chef, splitting his bread and fish (well cous cous and figs actually) between us. Having food sorted means I won't have to wander down the valley road in search of a supermarket in the morning. My alarm clock is set for 8.30am, as it goes off I can't help but feel like I need some more sleep. There is a pleasant noise of quiet chatter in the camp and I can faintly hear the road in the distance. I snooze my alarm clock and try and get another 10 minutes sleep. I try and maximize my time in my sleeping bag doing some tent based jobs whilst I am still in it. I start to pull out the clothes I need and get a couple of things like toiletries and gadgets together in a little pile at the side of where I have been sleeping. With literally no more jobs I could do from the comfort of my sleeping bag, I finally get myself ready and get out of the tent. I'm totally surprised by how steep the terrain is all around me and I realise that we have been camping at the foot of an incredibly valley. I take a longing gaze to try and take in as much as I can, looking at the different rock formations and trying to speculate in my mind whether they could be climbed. Norway looks quite a lot in real life like it does on the TV. I'm in time for the 9 am briefing, which is being held by Tom who has been out here already for a week preparing for the expedition. Tom is a tall expedition and mountain bike professional who looks a lot like me if I was to be stretched upwards a foot and if my waist was to be shrunk a few inches, his long blonde dreadlocks finish off the image quite nicely. If we are the A-Team, Tom is most definitely Hannibal right now and he lays out the maps and starts talking about grid references and route plans just like an army general would. We are set to leave from camp at 11 am and my watch says it's 9.30am. Feeling like I have loads of time, I start to leisurely pack my bag for the next 20 minutes. Tom heads over to the groups and tells them they need to get a move on because the bus is leaving to drop us off in 11 minutes. I have a look at my watch and find its only just before 10 am, I'm not sure what Tom is on about right now. Realising that my watch is in a different time zone and that I actually do have now less than 5 minutes to do at least 15 minutes worth of packing, never mind brushing my teeth and going to the toilet, I start to get a move on. Thankfully some of the students are not quite ready when I finally manage to get myself sorted. This takes the focus off the fact that I was late and I try to stand there as if I have been waiting for ages. The drive up in the mini buses is spectacular and even though I am keen to get off and a start walking, I really don't mind this journey at all. There is a slightly unusual air of quiet in the bus and I put it down to nerves. This group have got a big day of walking ahead, in a foreign country on a route they haven't walked before. After a short briefing on how to use or satellite emergency phones from Matt, Jerry and myself are sent on our way to get in front of the group. My bag feels heavy. I'm already really hot and sweaty from the walking. I try to reassure myself with the slightly comforting memory that the first hour is always the hardest on walks like this. I know that once I've made it through the first hour I will be fine. As we walk on I'm still feeling unusually hot and as jerry turns to look at me, I can't help but notice that he seems totally fine. Jerry is clearly a descendent of a mountain racing snake and he looks fit and like he isn't carrying any excess weight. If Carlsberg made mountain leaders I think they would look like Jerry. The first hour goes by and in all honesty I do feel a bit better. My body goes into automatic, seeming to remember how to walk. This bit of the walk is made all the more easier by the wealth of conversation that is being shared between jerry and myself. We talk about cameras, astrology, life choices and even the joy of storytelling. When we finally reach our lunch spot however, I'm more than happy to stop and have a break. I try and ration out the figs and raisins that I have and we chat about the route planned route that lies ahead of us and the groups. After a short break, Jerry heads off to the next check point while I wait here for the first groups. The first group takes a very long time to reach me and I make a note of checking that the group has headtorches and a plan for if they get stuck out overnight. They seem surprised that I'm asking this, but experience tells me this is going to be a late one. The next two groups arrive pretty close together and I let them both get on their way before I pack my bags ready to move on to the next check point. At this point I am pretty certain that the groups won't make the intended camp, but they seem very switched on about this and that puts my mind at ease. The rest seems to have really helped me to recover and I bound downhill like a turtle on a skateboard. I take a slightly different route to the others and it isn't long before I actually overtaking the groups again. In the distance I can see the lead group that I have nicknamed the "lone wolves" and make it my mission to catch them up. I even surprise myself with how quick I'm moving and it doesn't take long before I'm close behind them. I decide to take a different route to the group and spy a small summit off the intended route to head for. As I look up this route, I realise how steep it is and consider turning back. Feeling bold I head on up it and try and make some good ground by walking in 40 step bursts. The ground feels very steep and grassy underfoot and I wonder how long it would take for someone to find me if I fell. This is motivation enough to get a move on and get to the top. On the summit I am welcomed by a solitary rock that has clearly been placed to signify the high point. I place my sweaty bum next to it and have a moment to myself. This is the life. I have the lead group in my sights and I decide to keep high up on the tops of the hills rather than drop down to be right next to them. I try and keep out of sight from them so that they don't feel like they are being watched. I don't think I would make a very good spy, Im pretty easy to spot. Bright green bag, bright yellow sleeping mat strapped to the back of my rucksack and a set of walking poles tapping away on every step. Jerry has moved to a point where he will supervise the groups as they have a look from an immense viewpoint at the top of the valley. The viewpoint is a sheer drop, where if you let a stone go, it would probably go for about 300 meters before it hit anything. The viewpoint looks incredible from where I'm stood and I can't wait to get to Jerry so that I can look myself. As I’m approaching jerry, he says he has spent the last 20 minutes trying to text me on my satellite communications gizmo that I've been given. These things look like a cross between an early 90s mobile phone and a GPS unit. They certainly are the sort of thing that I can imagine professional explorers using. The only problem is that they are a nightmare to text on. They only have 3 buttons and the software looks like it belongs in a previous decade. This isn't to say that they are not very good at what they do, but to send a simple "where are you?" message takes a very long time. As the first group arrives at Jerry we both know that the other groups are going to be out in the dark. We make a plan that he will take the first group to camp and that I will meet the second team with Matt keeping track of the third. This sounds like a good plan, but trying to type all that into the satellite coms system is a difficult task. I do the best I can to send the message to Matt and I leave Jerry so I can meet up with the second team. I wait on a rock clearly out in the open for my team to arrive. The light is fading fast and my level of concern is rising. I give myself another 10 minutes before I will walk back and look for them. Just at that point Matt sends me a message on the sat unit telling me that the group are camping out part way along the route and can I come and meet them. He gives me an accurate description of where they will be and a grid reference too. I have a sly smile on my face as I imagine how long it must have taken him to write such a detailed text. I reply with a simple "yes" and get moving. The group are exactly where they are supposed to be and it doesn't take me long to get there. They seem in really high spirits and are laughing and smiling about the situation. To be fair to the group, they have picked a spectacular campsite, high up in a mountain pass with some large patches of remaining snow nearby. It is so still here, you could hear a pin drop, there is literally no wind or noise pollution at all. The sky is clear and the stars are all out tonight. I make short work of putting my tent up and sit down to make some dinner. I have a sachet of instant noodles to make up and Im actually really looking for to them. I can tell how tired I am because I have to read the 3 stage instructions about 5 times before I understand how to make these noodles. 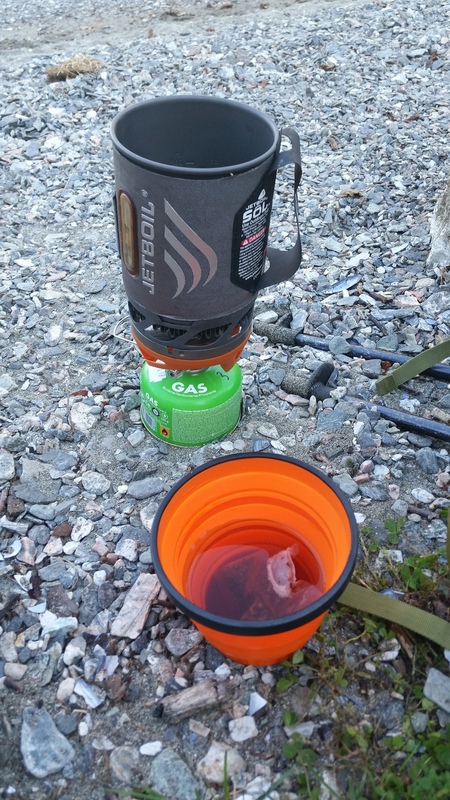 I fire up my Jetboil, wait for the water to get warm and open up the packet. Much to my amusement there are 4 various sachets of flavouring and spices when the instructions only mentioned two. At this time of the night I cant cope with this level of madness and bundle it all in. Ive worked hard for these noodles and they taste great. I treat myself to a fig for desert and start to wrap myself up. Im expecting cold night so I put all my layers on. I do a final zip up of the tent and start to close my eyes. Just at that point “my friend” the sat coms unit bleeps at me, it’s Jerry checking we're ok. As I don't have an hour to spare to give him a proper message I simply reply “yes”. I closely eyes and listen to the unmistakable sound of nothingness. The stillness of the morning is interrupted by the faint sound of bells in the distance. Every sheep that I've seen so far in Norway has a bell attached to it and 3 nearby sheep think that they will give me a wake up call. This sheep-shaped alarm clock is actually quite pleasant and I resist my usual temptation to get out of bed, walk across my bedroom and to press snooze. Unzipping the tent reveals a glorious landscape capped with a blue sky. I feel like I'm on the front cover of Trail Magazine. While I'm packing away my tent I can hear in the distance the sound of Matt's group coming over a nearby hill. They are probably only talking quietly, but the stillness of the environment carries their sound so well that I can almost make out their conversations. I have a brief chat with Matt when he arrives and we joke about the difficulty of sending a text using the sat coms unit. My group are not quite ready to go yet, so I arrange to meet them near the viewpoint and pick up my bag which almost impossibly seems heavier today. As I head out to the viewpoint I can hear nothing else but the crunch of stones under my boots and the sound of my poles clicking on the ground. This landscape looks like it belongs on the moon, littered with billions of small Rocks left over from millions of years ago. I am in awe at the remoteness of the environment I am in. The group arrive as planned at the viewpoint and are keen to get up to the top and see the view. We drop our packs and scamper up the steep rocky hill side like well trained mountain goats. We stop to regroup near the top and to wait for the last few people to arrive so that we can go over the summit together. One member of the group asks me if I am scared of heights? I try to explain that I'm not scared of being up high, but I am afraid of falling to my death. What I said seems to make sense to her and without saying anything she gives me an understanding nod. The view from the top is just as expected, breathtaking. The walls that line either side of the fjord are exceptionally steep and because of this the valley floor is dark and in shadow. The group nervously tiptoe near the edge and take the mandatory pictures to show parents and of course ones for Facebook. Matt is already at the top and is fiddling with his sat com trying to get a message to another group. He asks me to head off in front of the groups and to find a meeting point that he indicates on the map. Taking one last look from the top, I bound back down the hill and collect my heavy bag. Once off the ground plateau near the summit I start to head steeply down into the next valley. The path is there, but is mainly a dirty mud track that is actually very slippery. It doesn’t take long before my feet fly from underneath me and I crash down onto my side. "Oh no, my oatcakes!" is my first thought as I lie in the mud of my side. I don't even really like oatcakes that much, but at this point in the expedition they are as good as any food that you have ever tasted. The oatcakes in my trouser pocket are miraculously still intact and I breathe a sigh of relief. My second thought is to whether I am OK? A few light scratches, but nothing more. My thoughts turn as to why I felt like the oatcakes were so important and I acknowledge to myself that food on a trip like this is earned rather than given. With no chance to get any additional supplies and surviving on only what I can carry, every gram that you carry becomes valuable. I take my time to unwrap the oatcakes and have a tiny bite, they taste delicious. I arrive at the meeting point and find myself a beautiful spot near an old broken bridge over a beautiful mountain stream. I take shelter from the sun like a troll under the bridge, this feels quite fitting for Norway. I brush my teeth, paddle my feet in the water and treat myself to another oatcake. The shade under the bridge is lovely as I wait for my Billy goats to arrive. One by one the groups arrive and sit down for a well-earned break. Some of the individuals in the team are clearly finding it harder than others, but on the whole they seem to be enjoying it. The teams are scheduled to kayak for two days from tomorrow morning as they continue their journey and this means that at this point they are in the home straight for the walking part of their expedition. I chat to the groups briefly about their progress and start the final descent to our mid expedition camp. The camp is on a postcard style beach with the water in the fjord only a few feet away. The valley is guarded by the immense monoliths of rock on either side, watching over the water between them. I’m greeted in camp by the team that have been leading the kayaking with the other groups in the fjord and we sit down for something to eat. The other staff tell a tale of how some locals caught a huge halibut the night before and cooked it on the open fire and shared it with them. The story of this massive fish sounds too good to be true until Tom produces several parcels of tin foil each containing a massive slab of freshly cooked fish. I break into one of the parcels and the fish tastes delicious, each one of these parcels are probably worth at least £10 back home and we have been given one each! Late on in the evening Tom talks of how the "lone wolves" group are planning to set off tonight in the kayaks and find a wild camping spot a few km down the lake. He needs a small team of staff to help supervise and wonders if I fancy it. As I am tired I actually don't jump straight at the chance, but the fear of missing out gets the better of me and I say yes eventually. Jerry is up for it too and becomes our 3rd musketeer. The light is fading fast and we pack up our kit and head off behind the boys. What followed next can only be described as one of the coolest things I have ever done. We followed the boys down the water in almost pitch black with no headtorches on, we were like kayak ninjas. The water was incredibly still, you could drop a pebble in the middle and the ripples would reach the side. This adds a level of comfort because the conditions were so easy, but it also adds an eerie feeling to it too. We follow the boys down the lake and watch them find their spot and set up camp, we talk quite a lot about how cool they must be feeling right now. Once we confirm the boys are set for the night we start to head back. Its now totally pitch black and we have about 5km to paddle down the centre of a 2km wide Norwegian fjord. We keep talking to each other so that we know where we are, keeping to this unsaid rule of no headtorches. The night is prefect and still and the stars are so clear in the sky. The milky way is so clearly visible and we even see a shooting star. As we reach our camp again, we start to slow down as if we are trying to actually prolong this incredible experience. Jerry reveals that this is only his second time in a kayak and Tom and I laugh knowing that tonight will be hard to beat! Our kayaks grind up onto the pebble beach at camp and we are home. After a few well done handshakes we all head back to our tents, having one of the best days ever. I lay in my tent and I can't believe what has just happened, so much so that I cant sleep even though I'm actually exhausted. I eat a couple of tortilla wraps to pass the time and I lay back and try and focus on the sound of nothingness once more. It was a cold night last night and everything is covered in dew. This isn't a surprise because the camp is tucked in an idyllic cove that won't see the sun until at least midday. Today is the switch over day, the 3 teams that have just completed their walking route will now kayak for two days and those who have kayaked the last few days will now walk. This means that I will reverse the route I have just walked for the last two days and will end up back at the original start point. I know from the start this is going to be a big day where quite literally every step will be uphill. I walk to the pier on the lake, which marks the start point of the route for the next 3 groups. The spot I’m at is real picture postcard material and it's only at that point that it dawns on me that the only way to get here is either to walk in or to get the ferry. The only noticeable sound is of local builders, clanging their tools against metal and wood and making short work of a house they are building. After waiting 20 minutes past the arranged meeting point I head off to find the girls that are camped nearby. To get to the camp where the girls were last night you have to cross a small, shallow river. Maybe this is why the girls haven't arrived yet, because they are not sure where to cross? I find a spot to cross the river and start to head out. The water is actually looking deeper than expected now I am up close and with the stones being more slippery than a greased up eel I make a quick retreat. There was no way I was risking water coming in over the top of my boots, so I slip them off and enter the icy water with them in hand. After getting across the stream I find the girls at their camp unsure as to what they should be doing. I give them a short brief and we set off back to the river and the original start point. Feeling confident (and holding a 100% success rate) I slip off my boots once again and show the girls how to cross the steam. One by one they start to move across inch by inch. Walking across streams and staying dry is a fickle game and the odds were that sooner or later one of us was going to go in. I still held my 100% success rate as I made it across to the other side, so it was going to be one of the girls now that ended in the water. Of course, as predicted, one of the girls looses her footing and plants her bum firmly in the stream. She looks a bit disappointed that she is soaked so early in the day, but she laughs it off and keeps in high spirits. I give the girls a half hour head start on the route and then head off behind them. This track was a doddle to come down, but I know it will be a long slog to walk back up. After about 45 minutes of walking I start to feel slow and bit unsteady on my feet and a little bit dizzy. I knew instantly that it was dehydration. It is no surprise, as I knew I wasn't drinking enough water over the last few days. I walk on a little until I find a bridge over the river and drop down to fill my bottle up. Its hard to resist the temptation to take a couple of sips and walk on, but I remind myself that it is exactly that reason that I'm dehydrated. I make myself drink a full litre and then fill up again so I have some more water for the journey. Almost instantly I feel better. The walk up to camp is exactly as I thought it would be, really hard! I'd usually skip up this, but with 2 days of hard walking behind me and an expedition pack on my back, it's a bit of a slog. The girls have made a decision that they actually want to walk further than the intended camp to give them a much easier second day. This now means walking up a very steep and difficult hill, which is likely to take over 2 and a half hours. This hill and I have unfinished business, this is the one that tried to claim my precious oatcakes. If I was ever put into a set of top trumps cards, mental toughness would be one of my highest scoring attributes, aerobic fitness would be one of my lowest. Physically this is going to be a challenge, but mentally I know it's actually a walk in the park. Slow and steady wins this race. As I walk up the hill I alternate between my two speeds, slow and stop. I look up at the girls and while they are in high spirits, they also seem to be finding it tough. After our predicted 2 and a half hours, we reach the top of our slog. I’m actually really proud of the girls and I make sure I let them know that. We are back on our lunar landscape and it looks more beautiful than ever. As the sun is setting it is causing solid black outlines of the mountains in the distance, it looks like a painted backdrop from an early Hollywood film. We set up camp, boil up some water to make our tea with and start thinking about the next day, at least tomorrow is easier, around 90% downhill at least, Its pretty much the polar opposite of today. Im some ways in looking forward to finishing and having a shower, but on the other hand I wish I could do it all again. I sit with Jerry for a while before heading to bed. Just as Im leaving Jerry starts to write a message on the sat com to Matt. Id love to stay and help write the message, but I dont have a hour to spare! It is a cold night night and it's certainly a cold morning too. Im not sure whether I just needed a warmer sleeping bag, or maybe I just didn't go to bed warm enough, but every hour I seemed to be waking up and moving around a little to try and get warm. Experience tells me that the best thing to do now is to simply get out of bed and just get moving. The sun is on the way up and it's already really bright on this mountain plateau that we have camped on, I know that it will be really hot later on, but right now I'm pretty well frozen. After defrosting myself whilst packing my tent away I start to head over to the base of the summit with the incredible viewpoint once again. I have arranged to meet the girls here this morning to check in with them and I can see them slowly moving across the hillside like ants to a dropped jam buttie. Not all of the girls are keen to head to the summit and they put this down to an aching knees and a sore back from the rucksack. To be honest I totally understand after yesterday that they don't really want to walk any further than they have to and if I wasn't leading these other girls to the top maybe I would give it a miss too. Just like the others teams, the girls are in awe of the incredible landscape. They are taking so many pictures and just can't get enough of this unique scenery that is in front of them. The ladies pose for pictures like they are some kind of mountaineering girl band and take the mandatory selfies for facebook. As they thank me for taking them to the top, I am once again am reminded why I love the outdoors and I love people too. It is such a privilege to be the person that can help them to access this incredible moment in their life. With the whole team reunited at the base of the summit they once again pick up their almighty expedition packs and head off on their journey. I give the girls a good head start and slowly start to plod along behind them on their route. I actually feel really good now that I have warmed up, but I am still fully aware that I have to get not only myself but all the girls and the other teams safely off the mountain. My role today is once again bringing up the rear of the group, essentially if they take 12 hours to walk back to camp, so do I! I stop early on to fill up with water, I certainly wasn't going to be the dehydrated mess that I was yesterday. I’ve also made a point of making sure that everyone else has enough water too, I’m pretty sure most people haven't been drinking enough. Just as Im dipping my water bottle into the stream I hear the sound of my sat com going off in the lid of my bag. It is Jerry and he wants to know the location of the girls and also the expected location of the group in front of me too. This is actually quite a lot of madness to put into one simple text message, but I get my map out and start clicking away at the basic buttons of the sat com. It takes me a good 20 minutes to work out all the information required from the map and to put it into a text and just as I press send it says, "your message contains too many characters, please delete some of your message and try again." I think to myself about how long ago it was that we put man on the moon with that basic technology and wonder why on earth it is that in 2014 I can't have some more characters for a simple text message. After a brief mumble to myself about technology I reformat the message and send it off to Jerry. This delay puts me a good half and hour behind where I would like to be shadowing the girls from and I know I'm going to have to put in a good pace to catch up with them. This is the last bit of uphill I will do on the entire expedition and my legs will thank me when it's over. It actually doesn't take me very long to catch up to the girls and they are clearly slowing too, I remind myself of how much more effort they must be putting in mentally and physically to do this, as unlike me this is their first time on a journey like this. Its 14:00 and they girls stop for lunch next to a beautiful Lake at the top of their final descent, at this point I sense that I am in for a long day. Sometimes as a guide or a group leader you just know, you just have that sneaking suspicion that the next part of the journey is going to be epic. With my spider sense tingling once again I explain to the group that they need to get a move on with their lunch and get cracking with their descent. Looking on the map, it really doesn't seem like we have very far to go, only 2km to the bottom of the hill and then another 5km of walking on a flat road back to camp. Reading the map and observing some of the exceptionally close together contour lines, I can make an informed assumption that this path will be steeper to walk down than anything the girls have ever experienced before, all this with expedition packs on their back. Even though the girls are in high spirits the expedition has clearly taken its toll on them physically and emotionally. The downhill section that they have between them and the valley floor is split into two distinct parts with the second steep section being considerably steeper than the first. The girls find it tough going and as I follow them behind I can hear grumpy tones in their voices and a few choice words being said between them. After four days of living and working closely together, tensions are running higher than normal, and patience is wearing a little thin. I convince myself that because this is their expedition and I am just an observer, at this point I must let them work this out for themselves. Therefore I do what I have done for so much of their expedition and pull out my roll mat, sit down on the ground and find some wild blueberries to eat. The time it has taken for the girls to complete the first section of descent is at least double what they were expecting. As I approach the second steep part of the journey to the valley floor I realise once again that we are certainly going to be arriving in camp much later than planned. The girls are still grumpy with each other and it seems that the motivational words of encouragement they have been constantly giving each other have stopped being effective and have started becoming annoying. I imagine that this is what it was like when the spice girls broke up and how even though the magic between them was so great, it just simply wasn't meant to last. These girls however needed to keep it together until they got back to camp and they simply couldn’t call it a day half way down the mountain. I make a decision that it is time to be more present with the girls, even if just to keep the peace. I ask them to have a little rest and I chat to them about how far they have come and how important what they are doing really is. The whole experience clearly is overwhelming and one of the team starts to have a panic attack. This changes the dynamic of the group completely and they once again rally together to support one of their team who is in need. It is actually quite a beautiful moment and I really can see that for these girls, the bond between them is more important than the expedition goal. The girls are superb and I have to do very little, in some ways this reconnection with who they are as a group of teenage girls is exactly what they need. With the girls now in a slightly different mental state following the emotion of the panic attack, they once again start to enjoy each others company and I offer some jokes and riddles as we walks for some light hearted relief. Little by little, step by step we approach the valley floor and the girls seem energised by the fact that they realise they are nearly there. I have spotted Jerry waiting for us down by the lake a good hour ago and I realise that he must have been waiting there for hours. It has taken us nearly 6 hours to walk 2km, but the time is irrelevant, at least the girls have nearly made it to the bottom. The only problem is, the girls seem to have forgotten that they have another 5km to walk back to camp. With only about 50 meters left to walk to the road at the bottom of the valley I see a minibus flash past on the road. It didn't go unnoticed by any of us that it was the same minibus that dropped all the groups off 3 days ago. As we finally made the valley floor the minibus pulled up right next to us and out of the van stepped the rest of the expedition leaders. This time they really did look like the A-Team coming to save the day and in my head I even said, "I love it when a plan comes together". The girls cry quite a lot actually and the emotion gets to me that much that I actually need to go behind the minibus for a moment to sort out my bag and do something completely irrelevant so that I am out of sight for a minute. They have finished and it is clear that it is such an achievement for them to have completed this journey. Rather typically of Jerry, he has prepared us a celebration platter of wild raspberries on a stone platter, you would pay good money for this back home. The girls accept this symbolic offering gladly and in their teary eyed state get onto the minibus. I am proud of the girls. I am proud of the expedition team. I can't believe how well I slept and I was certainly much warmer too. That feeling of having got everyone up and off the mountain safely makes for a much better sleep. I should have had a lie in this morning in, but I really want a long shower before everyone gets up. The post expedition scrub is glorious and feels much better than the baby wipe showers I was having in my tent on the mountain. Today is a rest day and the plan is to head out canyoning with one of the local adventure centres and I can't wait! It will be the first day that the expedition leaders will have been able to sit back and let someone else deliver the activities and typically in situations like this the leaders are the worst behaved and mess about the most! It does feel pretty wierd to be on the receiving end of the activity for a change and it certainly is hard not to try and help put or to put myself in a position of responsibility. After a briefing from our stereotypical blonde haired bronzed bodied male raft guide we get all our kit sorted and head off in the coach to the river. Raft guides in my experience are a specific breed and normally very straightforward in their nature, they live for their sport, spend a lot of time outside and are generally very good at what they do. This team are no exception and are made up of a collection of some of the world's finest paddlers and rafters and canyoneers. I try not to let it slip that I know "a little" about watersports, but it doesnt take long before I have let the cat out of the bag. The river is spectacular and the water is crystal clear and of course exceptionally cold, however our super restrictive and unflattering wetsuits will help to keep the chill at bay. The river is filled with spectacular waterfalls, incredible swimming and some pretty big jumps into the water. As expected our staff seem to be messing around the most and Tom and myself are heading up these water based antics. Like a pair of deadlocked canoyon ninjas, we proceed to jump, slide and leap from everything we can do! It is a real joy not to be in charge. After Tom and myself had to be forcibly removed from the river (kicking and screaming,) we boarded the bus once again ready for our well earned meal back at the rafting centre. Later on that evening after all the adrenaline had finished form the rafting and the groups had all settled down a little I made some time for the group of girls to get together to reflect on their expedition. The girls reviewed their expedition with maturity, intelligence, integrity and honesty and it is clear that it had such a profound impact on their lives. I try to share some thoughts with her girls about what I have seen in them the last few days and how strong they are as individuals and as a team, ultimately I just want to let them know how proud I am of them. Whitney put it best when she said "I believe the children are the future, teach them well and let them lead the way"
At the end of the reflection with the girls I offer to share a story with them. This story was going to be the one that I was planning to tell them on the valley floor yesterday when we all thought they would still have over 5km to walk to get home. The story is of the crescent moon bear and is about finding inner strength and is very much a story of the heroes journey that is told is so many different forms in cultures throughout the world. The ladies seem to understand the ethos of the story and recognise the significance it would have had the night before. I finish by explaining how this expedition will forever tie these girls together for the rest of their life and no matter what happens now, they will always know that they have shared this experience. We have to leave at 8am this morning and I set my alarm for 6.15 am so I have time for a 15 minute snooze and then a good chunk of time to get myself out of my tent and all of my kit packed. I switch the alarm off instead of snoozing it and I end up sleeping in past 7am. Fortunately I am a skilled professional in this field and in fact I'm pretty sure I could do a PhD in rushing to get everything ready in time on a morning. Experience once again prevails and I’m ready to leave on time. The valley is damp and cold this morning and I realise how lucky we really have been with the weather this week. After a typically British conversation with Mat about the weather, I start to play the luggage-loading version of Tetris, trying to get everyone's bags into the luggage hold of the coach. I’m pretty sure if you can fit as many bags as I did into a coach luggage hold, you deserve to hold membership with Mensa. For the first time on the trip it seems like everything is going incredibly smooth and we actually leave on time. We head off up the valley and I have that usual end of holiday feeling, the kind where you try and take in as much of the surroundings as you can on your "one last look around". We all saw it coming really to be honest and it was pretty much the unspoken thing, sooner or later the coach was going to break down. It was a cruel blow to the end of the trip as this has so much impact on us all getting home on an already tight schedule. However, little did I know that we had a specialist in the team, Mat has been playing around and building engines since he was a child! Like he was completing a challenge on the early 90s TV programme "You Bet", Mat set to work fixing the bus. If you had asked me to fix the bus, I would have just about been able to confirm that what I was looking at was an engine, however Matt clearly knew what he was doing. A few cable ties and pieces of cord later and the bus sprang back into life and started to pull away! On the way to the ferry port we have to pick up the missing half of our comedy duo of drivers who has flown back out to meet us to assist with the driving once again. I have previously referred to these two unique characters under many different names, but I finally realise now that they are most certainly Rodney and Uncle Albert from "Only Fools and Horses". This actually describes them perfectly and in fact I've heard “Rodney” on the phone several times to the individual back home who must clearly must be playing Del Boy. As soon as Rodney enters the bus once more the banter between him and Uncle Albert starts to fly once again. These guys couldn't even find out where a brewery is, never mind organise getting drunk in there. Fortunately Matt, Mike (the assistant head teacher on the trip) and myself take it in turns to sit in the Co pilot seat and give stage directions to this show starring the odd couple. I end up getting the first of the night shifts to sit with Rodney while he drives us through Denmark. Conversation is dry and try as I might it all seems to be one way and short replies from our driver Rodney. I find myself literally counting down the minutes until I can move back into one of the seats and fall asleep. It is the best feeling ever when I finally switch seats with Mike taking over the copilot duties and pull out my sleeping bag. I wonder how many times a year I must stay in this feathery bag and it doesn't just represent warmth and comfort it also brings back the memories of everywhere it's been. Nina Simone is once again my music of choice and I drift off filling my mind of great experiences gone by. Sleeping on a coach is such a strange thing, you're never fully asleep and because of this I am dreaming constantly. This is added to by the fact that I've filled my mind with a week incredibly rich with different experiences. I catch myself waking up, laughing in my sleep, I have no idea what is funny, but it's far preferable to a nightmare. Rodney and Uncle Albert are still having a nightmare getting this coach to the ferry port in Calais and as we stop in a service station in my dozing state I can hear them disagreeing about who is driving next and how many hours they are allowed to do before the next break. The relationship between these two individuals is partly intriguing and partly frustrating, they seem to have no idea how to work collaboratively on the mission of getting this bus back home and their comments to each other are always tainted with criticism and sarcasm at the expense of the other. I feel like helping to give them some tools and a structure to communicate in a healthy way and to satisfy each others needs, but this isn't the time or the place for my personal blend of relationship counseling. As we are passing through so many countries, but not really stopping to see them, I buy a Snitzel from the service station when we are in Germany, just so it feels like I've been there. As we all sit on the benches outside I look around at all the students and see a totally different group of people than who I saw at the beginning of the trip. I kept telling the group of girls that I spent the last day of the expedition with, "through the struggle comes the strength" and I can see that because they have all struggled in one way or another during this week, that the group are clearly stronger. Some of the best value money you can spend is money spent on experience, and boy have these incredible young people had an experience this week. I know that we are still in Germany, because I am still seeing motorway signs for Ausfahrt, this must be the most signposted city in Germany. I’ve never heard of anyone making it to Ausfahrt, but I imagine it's nice. Apparently we are making good time and potentially may even get an earlier ferry. I'll believe it when I see it. This is massively down to Matt who has literally been the coach driver’s manager and has worked out all of their hours and the distances they can drive. I’m pretty sure without Matt we would just be leaving the ferry port in Denmark now. I must be pretty well worn out as I sleep for a huge amount of the journey, as least this means I can't be distracted by the constant chatter between Rodney and Uncle Albert of driving hours and tacos. In an interesting twist of events, Rodney and Uncle Albert with Matt's guidance actually make it to the ferry port really early and it seems like we are potentially getting on an earlier ferry. The ferry port is busier than the mid 90s boxing day sale at Next and I'll be impressed if we can actually get a ferry on time. I have never seen it this busy and there must be 20 or 30 coaches all queuing, probably with the same idea. The security at the ferry port has been increased so much more than any time I have been to the port before and it resembles airport security today rather than the usual ticket check and move on. All vehicles are being checked and everyone has to move through the security booth and have their passport scanned. While we wait in the queue to have our vehicle checked, what appears to be a small family of people trying to leave the country “unnoticed” are marched between two members of ferry security. This happens right in view of everyone on our bus and brings a range of reactions from those that watch. I think we are incredibly fortunate to be UK residents and I think people often forget that. After another successful ferry journey where I didn't feel sick, we are once again on the road. However in a cruel twist of fate we are about to loose two of our valued team, this is the end of the road for Uncle Albert and Rodney. As they have driven so far, they are out of hours that they can work for and we are about to have a special guest appearance from the man himself, Del Boy down in Dover. All he has to do is drive us that last little bit home. It is a strange feeling leaving the two drivers behind, (real names Simon and Peter) as even though they have been the source of confusion and a little frustration at times, they kind of feel part of the team. I am once again reminded that it takes all sorts to make a world and in fact they are real people with families and ordinary lives away from driving coaches and this trip. This is it, the home straight, surely nothing else noteworthy can happen now. A small crowd of parents are our welcoming committee when we return back to School. So many of the parents give me that smile that says, “Thanks for bringing them back safe.” With our mission complete, I shake Matt and Mike’s hand and say “Same time next year?” They agree and we go our separate ways. I still have a 3 hour drive back up to Manchester, but I know there is a comfy bed ready when I get there, I cant wait!